As many times as I stared into those cool blue peepers on paper, never in my wildest dreams did I ever think they would stare back at me. It was the end of my birthday weekend extravaganza, and Joel and I were finishing up dinner at a restaurant. I spent the past few days doing exactly what I wanted to do and I had more fun than I could have imagined. I was in a fantastic mood. That’s where this story begins. I burst into tears right there at the table. On left: Displaying Ant pride with button flair on class picture day in 1984. 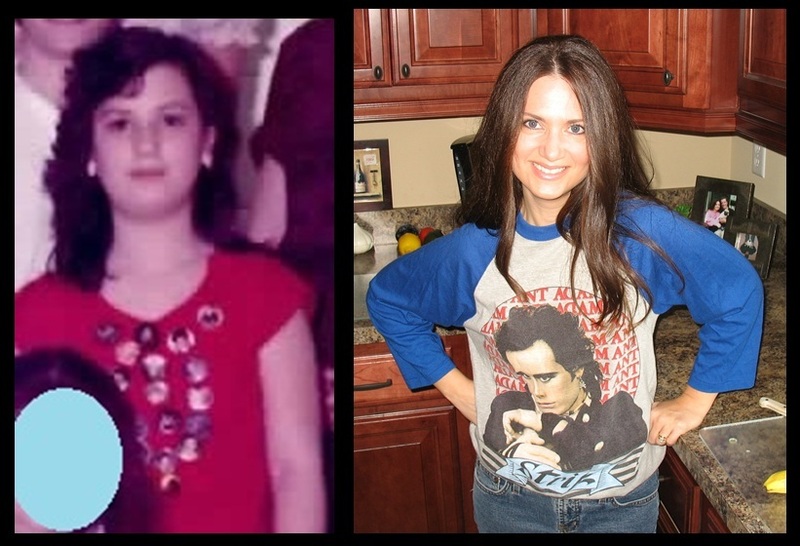 On right: Displaying Ant pride in a concert tee on grocery shopping day in 2009. I had two months to consider my meet and greet strategy. A few times while thinking about scenarios of how our brief encounter would play out, my side of the conversation would go from charming and delightful to adoring which turned into desperation, until I had finally reduced myself into a sniveling mess of tears and panic. I called Joel a few times to say I couldn’t do this; it was stressing me out too much. 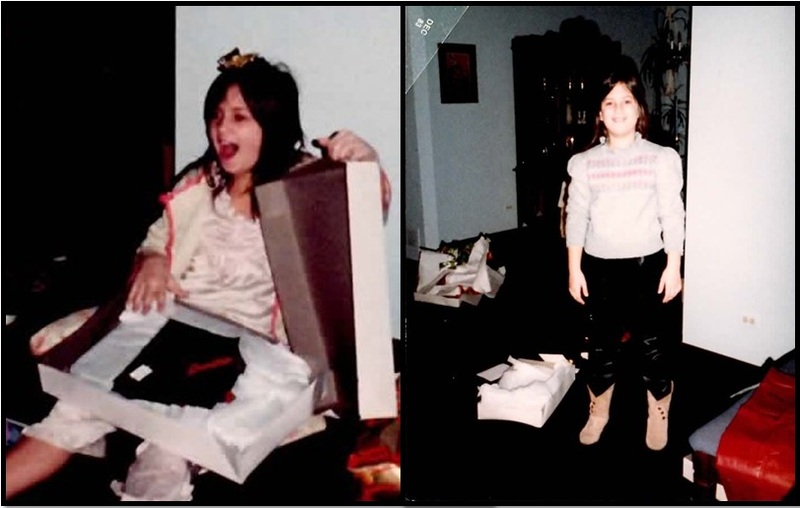 I was the only kid at school who wanted leather pants for Chanukah so that I too could look like a Dandy Highwayman. I was 10 years old when I first watched his “Stand and Deliver” video on MTV. 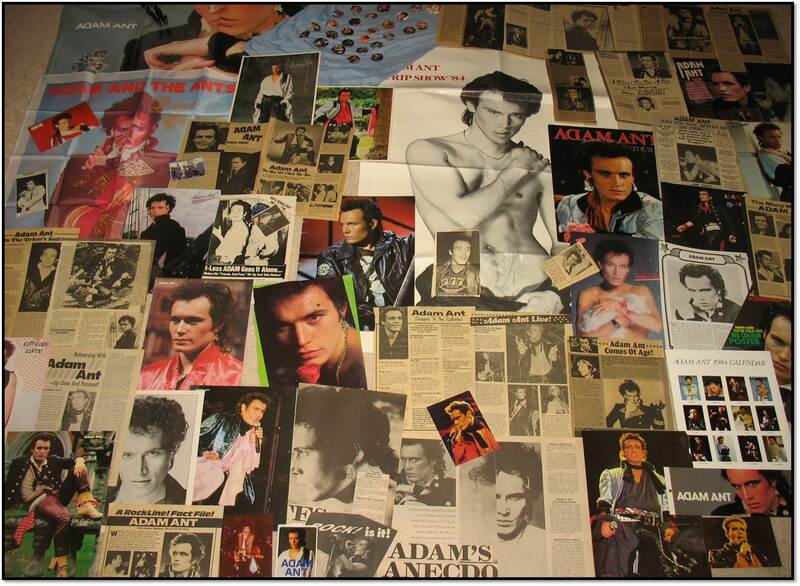 I recall crying hysterically by the end of the video and deciding immediately that I must have an Adam Ant poster. In desperation, a poster was created that evening (probably well past my bedtime) using poster board and markers. They were the moments that I’d become a fanatic for many years. 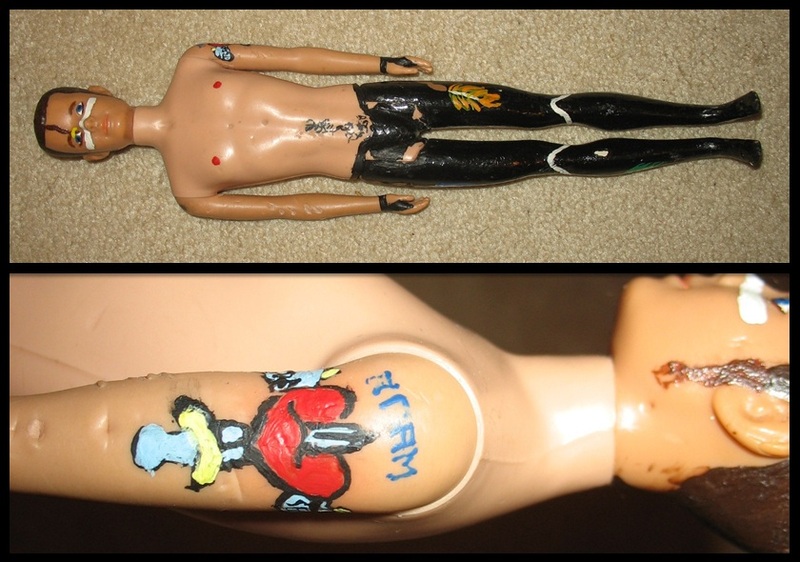 I had quite the eye for detail, hmmm? This is the work of a twitterpated tween. Bite marks on the arm were from the dog. Every feeling I was experiencing in the present was the culmination of all those tween years worth of wishing, hoping, praying, and wondering if I’d ever get the chance to meet him. It was a dream that just slowly faded over time. Wall decor and accessories courtesy of Teen Beat, Bop, and The Alley at Woodfield Mall (Schaumburg, IL) procured in the ’80s. There was already a small line formed outside the venue when we arrived. I couldn’t help but bounce and clap from my spot in line every few minutes from the sheer excitement. I looked like a grown-up but I was a kid again inside. Once we were let in, we found a spot just three people deep from the front of the stage. We were sure to get a great view and hopefully some direct eye contact. Below are some pictures from the The Blueblack Hussar Tour concert in Chicago on August 1st. 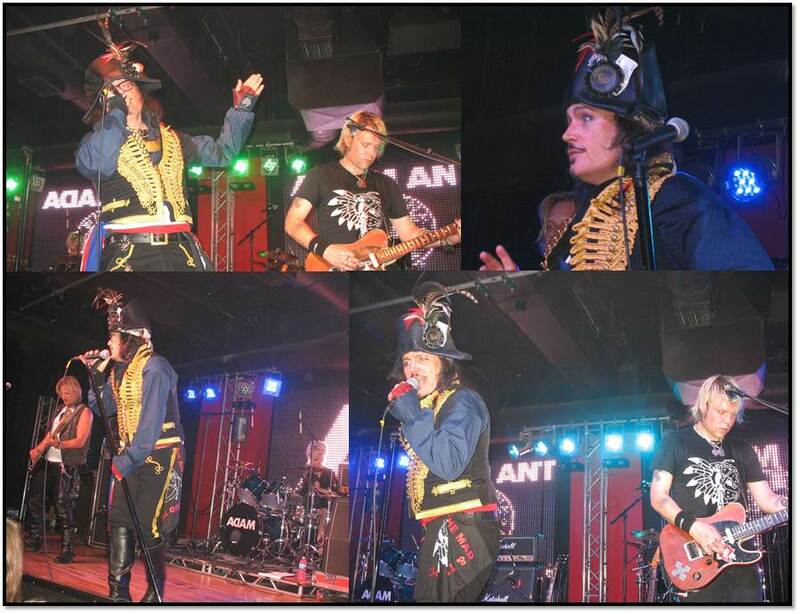 Adam Ant and his band did not disappoint. They gave it everything they had for two hours. They played new songs as well as many retro classics that had all of us singing loud and proud right along with him. It was an excellent concert and we all had a fANTastic time! I hope he comes to town again; I’d attend another concert in a heartbeat. After Adam was situated for the meet and greet, I watched other fans go one by one up to meet him and get autographs. I felt an odd sense of calm right before it was my turn. It was going to be OK. I was going to be OK. I was not OK. When I started to walk towards him to say hello, I didn’t realize I had my shaky hands covering my mouth as I started to mumble unintelligibly, so he leaned in to say he couldn’t hear me. It did somewhat work out in my favor, however, because I got an extra hug and a soft “there there.” Now, I can personally vouch for the gentleman’s comforting skills, too. On left: This is what I look like trying to smile while in a state of shock. 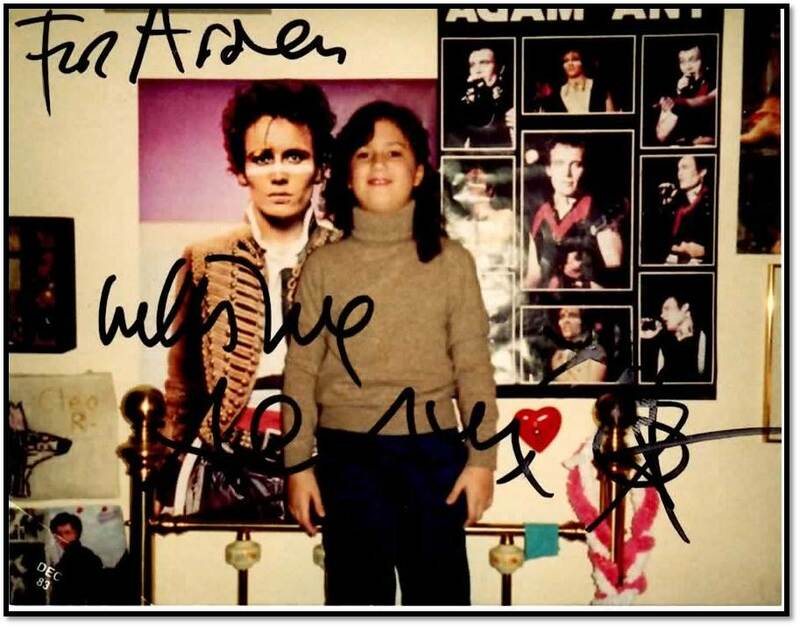 As he started to give me his autograph on what I had to sign (the new ticket stub, a 1984 ticket stub, and a photo of me in front of my Adam Ant posters) I thanked him for everything he has given to his fans through the years. It would have been great had I stopped there, but I think what I was saying sounded good in my head so I just kept going. And going. My nervous energy was unstoppable and I’d have loved to hear his thoughts but I never gave him the chance. I did, however, also mention that it was not a coincidence that I had the poster lined up “just so” and had likely kissed a hole right through the paper. That garnered a super-sweet smile in response. Joel’s portion of the meet and greet is simply a blur to me, but he later filled me in on telling Adam that I would not be the person I am today had it not been for his influence through my formative years. I left the building with the feeling of disbelief and the scent of his cologne in my hair. Isn’t it funny how someone you hardly know except for what you listen to and read about can be so influential? How impactful it can be to be seen and acknowledged by someone who really strikes your fancy? Wonderful story! I’m meeting him next Saturday in NYC and will probably react the same as you did! I’m glad you had such a good experience with him! Thanks for your comments Pamela! Yeah, no matter how much I tried to prepare to be cool, I still turned in to a deer in the headlights once we were actually standing a foot apart. (I bet he gets that a lot) 🙂 I hope you have a great time and enjoy every moment of it! !